All this talk of fan films yesterday made me think that Monday is a perfect day for drudging the sarlacc pit out back, and for posting over seven different, classic Star Wars fan films. Some of them are longer than the average YouTube series, while others are short and funny soda commercials. They’re also in order of less favorite to most favorite, and consequently time of release as well (maybe). To start off the line up is the classic, original Star Wars fan film Hardware Wars, made before computer editing existed and people still shot movies on actual film. Sure it shows a little bit, and the humor is obviously 70’s, but cut it a little slack, there are some gems amidst the thumb twiddling. I think it’s important to remember the originators of a movement. For one lucky kid in Canada, the movement was internet fan films, and though we may never know his true identity, we will remember him fondly as The Star Wars Kid. 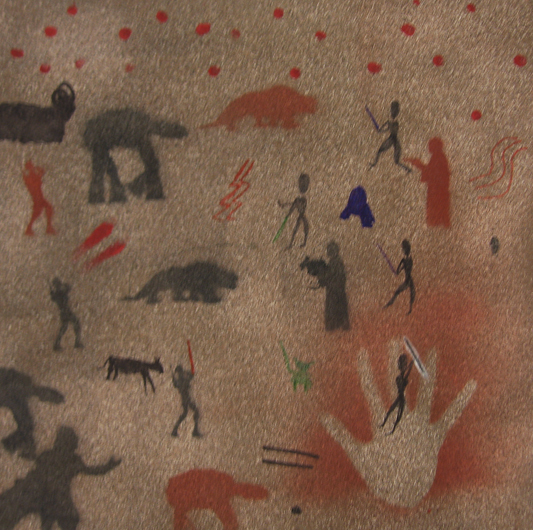 Originally, I was going to post some of that famous concept art using this title, but then it struck me: are there Star Wars cave paintings out there? I mean, the Mayans predicted the end of the world centuries ago; what if someone also realized that milleniums later there would be a film franchise unrivaled in magnitude and influence? Maybe some wizard prior to the Stone Age. Maybe a fanboy accidentally thrown back in time. 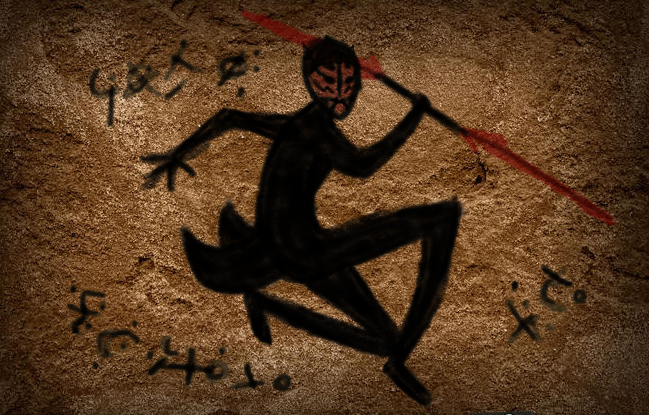 Either way, apparently archeologists DID recently uncover a number of cave paintings that bare striking resemblance to certain characters from certain science fiction films. I’ll let you be the judge. Alright, so this first one looks more like some kid drawing on his wallpaper. And what about the dude just above the pointer finer who looks like he’s hugging a kangaroo? You know? 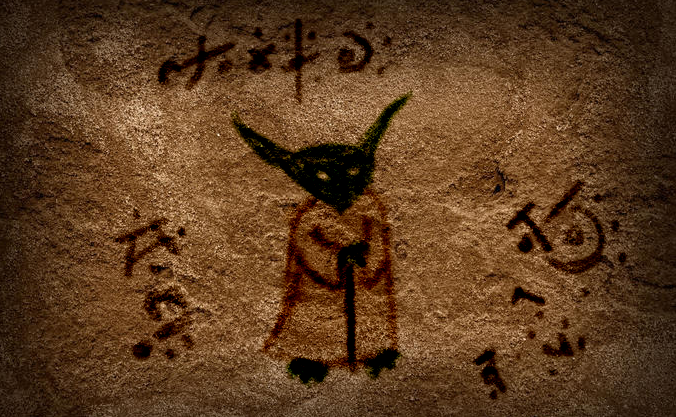 It’s possible that, since the adventures of Star Wars occurred long, long ago, a Jedi, or someone familiar with Star Wars lore and from that universe, became stranded on earth millions of years before modern civilization. Maybe said person or people even helped start humankind. And maybe Lucas then found their history logs buried in some woods near his college!